Police are searching for the driver of a Mercedes involved in an apparent road rage shooting in the East Bay. 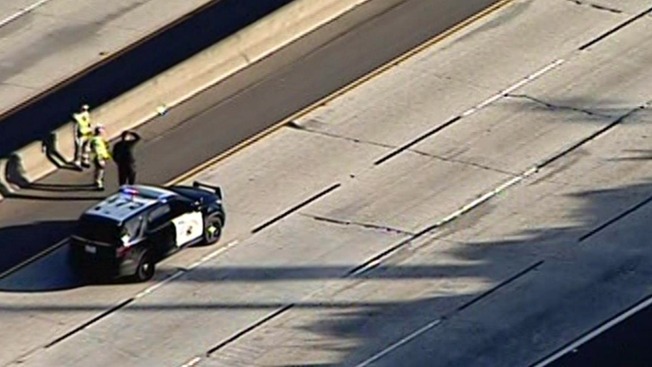 The shooting investigation prompted the California Highway Patrol on Monday afternoon to shut down a section of eastbound Interstate 580 in Oakland. The closure started just before 3 p.m. and lasted for about an hour, according to the CHP. No injuries were reported. CHP said a Honda had been tailgating a Mercedes when the driver of the Honda attempted to pass the Mercedes unsafely while making a rude gesture. The driver of the Mercedes then passed the Honda by using the center median and fired multiple shots at the Honda, according to the CHP. The Honda was struck several times, but neither of the two occupants was injured, police said. The suspect vehicle is described as a black Mercedes four-door sedan. The rear license plate was missing, and the front plate was tucked between the dashboard and the windshield, officers said. The driver is only described as a black man. Since November, there have been more than two dozen shootings on Bay Area freeways. Most of the freeway shootings are concentrated in the East Bay. Anyone with additional information is asked to call CHP investigators at (800) 835-5247.